Stuffed peppers but in soup form. A total winner. It’s easy, hearty, and packed with flavor. 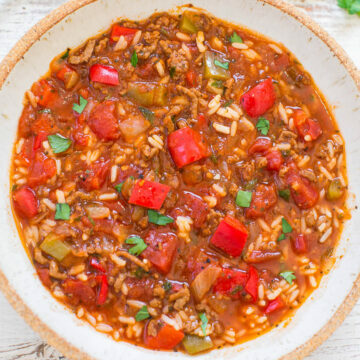 After browning ground beef, onions, red and green peppers, and garlic on the stove, transfer everything to your slow cooker where it simmers away in a tomatoey broth. The recipe comes from Gina Hmolka who blogs at skinnytaste.com. 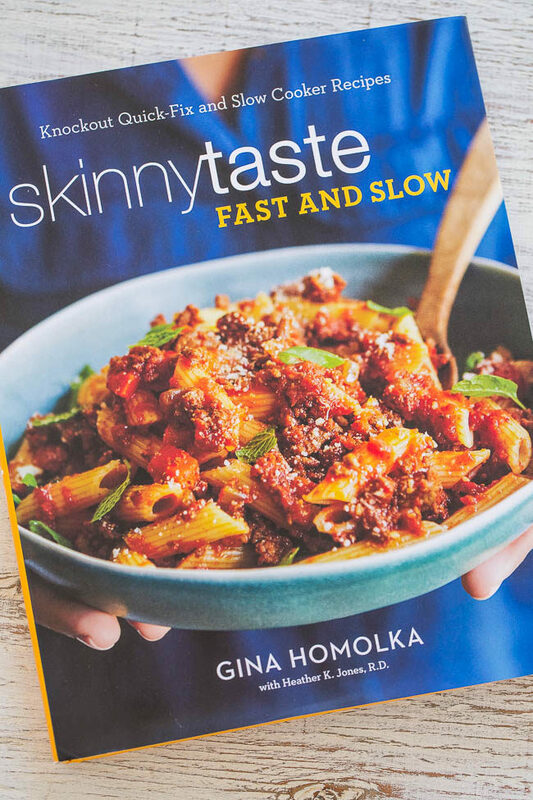 It’s in her new cookbook, Skinnytaste Fast and Slow. When Gina asked me if I’d like a review copy, I jumped at the chance. 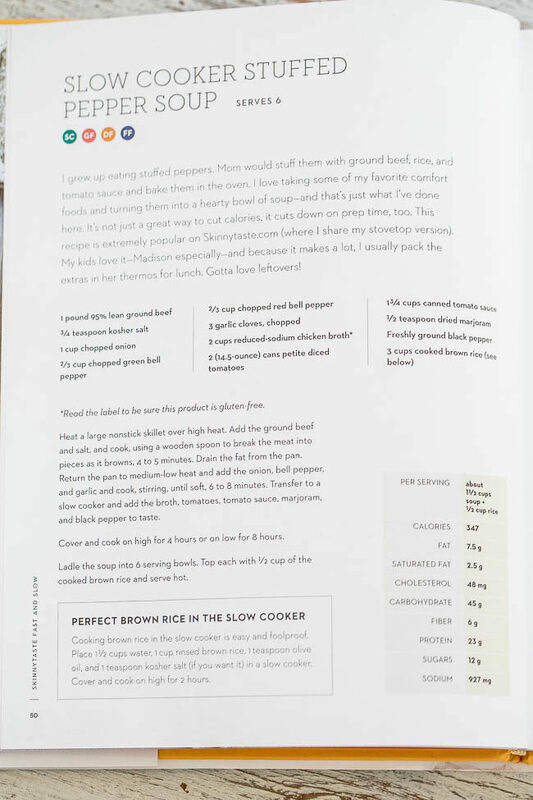 The book includes a combination of 30-minute fast recipes contrasted with those made in a slow cooker. There are so many practical and healthful dinner options that I had a hard time deciding on this soup. I know I’ll be turning to this book over and over. Because I’m a food blogger and therefore cannot just follow a recipe to the T, I deviated from her recipe slightly. I added more onions, peppers, a couple extra dried spices, fresh parsley, and used no-sodium petite diced tomatoes. Here is Gina’s exact recipe and mine is below in the recipe section. Pretty darn close but I wanted to mention it in case anyone wants to make her recipe exactly. To help ease weeknight dinner chaos, I cooked everything on the stovetop the night before, transferred it into my lined slow cooker, added the remaining ingredients, refrigerated, and the next night turned on the slow cooker in advance of dinner. Even though it’s still in the 80s in San Diego, we loved this comforting soup. Stuffed peppers but in soup form. A total winner. 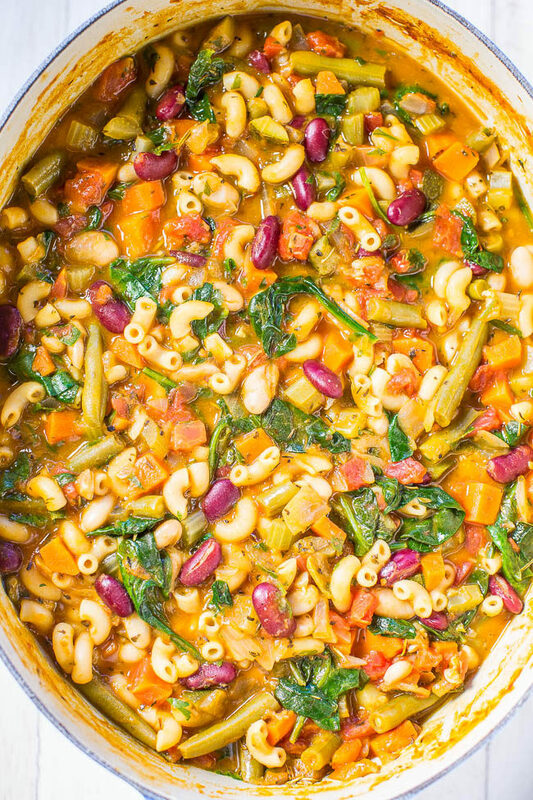 It’s easy, hearty, and packed with flavor. 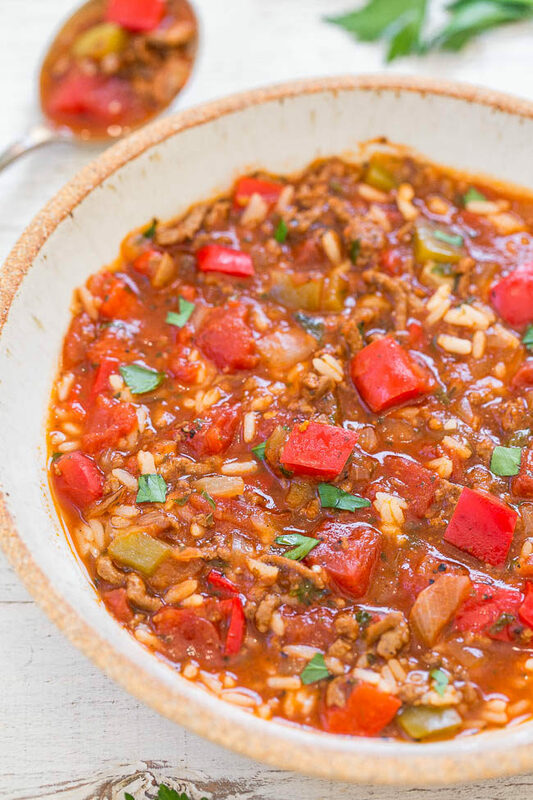 After browning ground beef, onions, red and green peppers, and garlic on the stove, transfer everything to your slow cooker where it simmers away in a tomatoey broth. To help ease weeknight dinner chaos, I cooked everything on the stovetop the night before, transferred it into my lined slow cooker, added the remaining ingredients, refrigerated, and the next night turned on the slow cooker in advance of dinner. We loved this comforting soup. To a large nonstick skillet or large Dutch oven, add the ground beef, kosher salt, and cook over medium-high heat to brown, crumbling it with a spatula as it cooks and tossing it to ensure even cooking. Cook through, about 5 minutes or as necessary. Drain fat if necessary. Add the onion, peppers, garlic, and cook for about 6 to 8 minutes, or until vegetables have softened, stir intermittently. Line a 6-quart slow cooker with a slow cooker liner if desired and transfer the beef mixture into it. Add the broth, diced tomatoes, tomato sauce, marjoram, basil, oregano, pepper, stir to combine, cover, and cook on high for about 4 hours or low for about 8 hours. All slow cookers vary in their heat intensity. Cook until done. Taste soup and make any necessary seasoning adjustments, i.e. more salt, pepper, pinch of sugar, etc. Ladle about 1 1/2 cups soup into each bowl and top with about 1/2 cup rice. 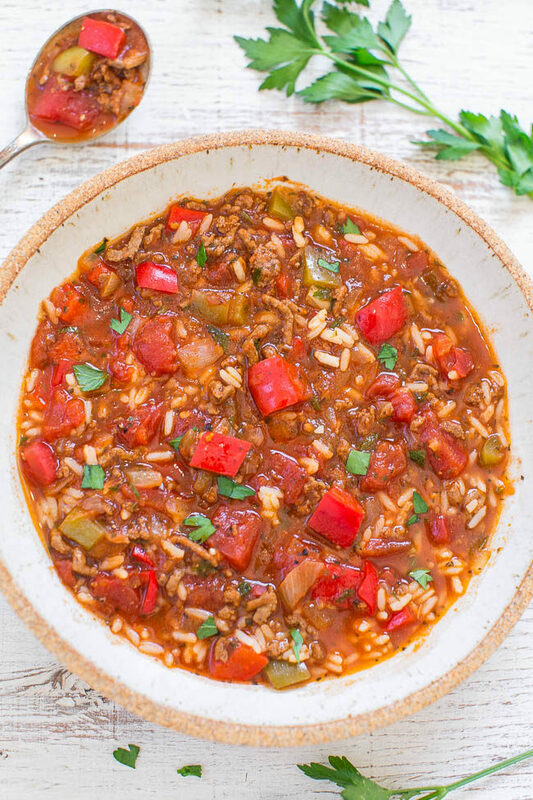 Tip – Don’t add the rice to the slow cooker because if you have leftover soup, the rice will turn very mushy in the following days. Instead top individual bowls with rice that you store separately from the soup in an airtight container. Both soup and rice will keep airtight in the fridge, stored separately, for up to 5 days or for up to 3 months in the freezer. FAVORITE SLOW COOKER RECIPES – All my favorite easy recipes that are made in a slow cooker from savory to desserts! We’re only about 10 degrees cooler in Ft.Wayne but I’ve been throwing my leftover vegetables in the vitamix and made a batch of bone broth in my slow cooker last weekend. I like stuffed peppers but this looks easier and just as good! I love that you do Vita soup and that you’re making your own bone broth…impressive! It’s been raining since last night and I have a 4 day weekend so I decided this was a good day to make soup for lunch. Jon said he prefers it over stuffed peppers and I love how easy it is. Great Italian flavor (we sprinkled fresh parm on top) and leftovers ( you know I love that too)! It was 94F during the day here Thursday. No sign of rain here! Glad this hit the spot and that Jon even prefers it to regular stuffed peppers! Parm on top sounds wonderful! More veggies and spices are my kind of recipe tweaks. I would have done the same. I’ve never stuffed a pepper. I did stuffed acorn squash and such, but it all just seems like a too much of a process for me. I guess I’m lazy. It also seems like a waste, since, I mean….you have to get it all messed up to eat it anyway, right? You and I think alike. Veggies, spices, and the less work the better! Ooh, a soup recipe that’s also a crockpot recipe! You hit on two of my favorite fall/winter meal ideas. 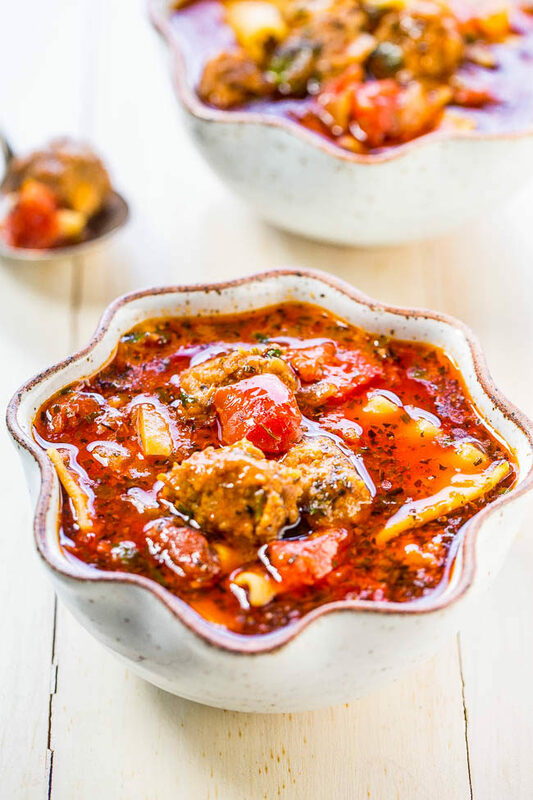 After trying several of your soup recipes last winter, I’ve decided that you have a great sense of what herbs/spices taste good in soup, so I’ll be trying your version of this recipe. :) Keep the ideas coming! We are having a cold couple of days so this is great timing! Hearty soup is always a hit in our house. Besides, stuffing peppers is too much work! I’ll take this soup instead! What a fabulous recipe! I totally need her book. So many great dinner ideas I know you’d love! Sounds yummy but, why use chicken broth in a hamburger based soup? Wouldn’t beef broth be better? The author used chicken broth so I did too. I always have it in my pantry whereas beef broth not so much but I’m sure that would be fine. This looks fabulous. I’m making it this weekend. Less fuss than actual stuffed peppers. This looks yummy, im going to try it on this rainy day. Do you drain the diced tomatoes? Can I prep the night before like you did but not use a liner? I’ve never prepped the night before but my evenings have gotten crazy! This idea sounds great! I only use a liner because it makes cleanup so much easier but I’m sure you can skip it and prep ahead. This was easy and very tasty. I didn’t have marjoram, so I substituted thyme. I also added a couple stalks of celery that needed to be used. I had partial boxes of stock in my refrigerator, so I ended up using about half chicken and half vegetable. A nice hearty soup, will make again. Glad you enjoyed it and that you’ll make it again!